Rating: 6.6/10. From 427 votes. SIG Sauer‘s 1911 C3 suffers from none of the shortcomings that plague many small .45 ACP 1911s and offers performance very close to that of a full size pistol. Let’s see what it has to offer. The C3 I received for evaluation is an eye catcher. The natural stainless steel is mated to a black, aluminum alloy frame. By going with an alloy frame, weight is trimmed back to 29.5 oz. 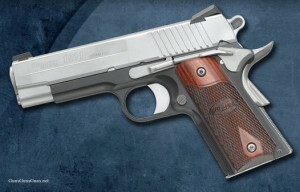 Stainless controls further enhance the appearance of this two-tone pistol. (If basic black is your thing, a Nitron finish C3 is also available.) Checkered rosewood grip panels make for a positive hold and also add another classy touch. In keeping with its discreet carry theme, overall length of the C3 is 7.7″ with height reduced to 4.75″. Length of the match grade barrel is 4.25″. In essence, we have a Commander-length top, sitting on an Officer’s frame. The front strap is checkered 25 LPI while the flat mainspring housing is checkered 20 LPI. SIG uses only premium quality parts in the C3 and no MIM or plastic parts are used in the construction. To ensure positive operation, SIG has outfitted the C3 with a palm swell, beavertail safety. A single-side, frame-mounted safety comes standard. This southpaw shooter would, of course, opt for an ambidextrous switch, but that’s easily remedied. An oval slotted hammer is also part of the C3 package. A set of Novak Night Sights helps get the C3 on target. Tritium inserts emit a soft, green glow which will help the user get a reliable index on a target when shooting in low light. The slide of the C3 sports grasping grooves milled into the rear for manual manipulation and the critical eye will also note an external extractor. The short-grip frame does necessitate the use of a slightly abbreviated magazine. Two stainless steel magazines that hold six rounds are included in the C3 package. One quality I really liked: The fact it used the standard recoil spring and plug guide instead of a full-length guide rod. I’ve never really seen the advantage of the full-length rod for a defensive pistol, and in my estimation, it only makes the gun harder to take apart and put together when performing routine maintenance. If there’s a slight accuracy advantage to the full-length guide rod, it’s lost on me. Examination quickly revealed the fit of the C3 is significantly tighter than most competitive pistols. Combined with the match grade barrel, hammer, sear set, and trigger, the C3 should shoot like a house on fire. On my Lyman trigger gauge, pull weight came up a little over 5 lbs., just right for a defensive single-action pistol. In most respects, the C3 was just like meeting up with an old friend. Control placement and trigger didn’t provide any nasty surprises, and the hits came with little effort. There were, however, a few subtle differences worth discussing. The short grip frame and the Commander-length slide give this pistol a distinctly nose heavy feel. This isn’t necessary a bad thing, just a bit different from other 1911s I’ve shot in the past. I felt the longer sighting radius was a definite plus and a big improvement over most of the subcompacts with which I seldom perform my best work. I assessed accuracy potential by firing five-shot groups at a target set 25 yards distant. I used a Hornady Delta Rest to help support the pistol when firing. Most groups ran from 2.5″–3.5″ with Federal’s 230 grain +P HST hollowpoint posting the best performance with a 2.375″ average spread. I’m quite convinced the C3 can achieve slightly better accuracy with a sharper-eyed operator at the controls. I also fired a representative sample of ammunition through an Oehler 35P chronograph to measure muzzle velocity. The 4.25″ barrel launches bullets at velocities that shouldn’t retard expansion. I’ve enjoyed very good success with the better engineered .45 JHPs when shooting through barriers into gelatin, and the C3 would be an excellent delivery system. Recoil and its effect on performance will vary from one shooter to the next. Clearly, light guns will prove harder to control than a full-size steel gun. That said, I didn’t have any trouble keeping the C3 in check, even when shooting at speed. Alright, you may have to back off on the gas pedal a little bit, but you can still put well-placed hits on target at a fairly good clip. Hot +P loads will definitely test you, but ball was easily controlled. For self defense, 185 grain hollowpoints (such as the excellent Black Hills load tested) are very easy to manage and would provide good results. Once the C3 had digested a couple hundred rounds, reliability was perfect. I did experience a 2–3 failures to feed the last round of the magazine early in the evaluation, but that problem soon disappeared. The SIG Sauer C3 is not only a handsome pistol, but it’s especially well-suited to its intended mission. With the right holster, the C3 is just as easy to conceal as a subcompact 1911 with a short slide, but it has much more to offer. Once we passed through the hundred round mark, reliability was absolutely perfect. As indicated earlier, your handgun must work each and every time. As much as I like 1911s, I’m a little more cautious before endorsing them as duty worthy and would run several hundred rounds through one before taking it afield. In the end, the C3 passed with flying colors. This premium quality C3 occupies a niche somewhere between the standard workhorses and the true custom numbers, which command a price beyond that of a good used car. Performance, however, rivals that of the high-end pistols. This is about as good as it gets for a production gun. The 4.25″ barrel mated to the short grip frame adds up to a gun that can be discreetly hidden in an IWB, yet packs substantial punch. SIG-Sauer’s C3 goes to the top of a very short list of 1911s ideally suited for concealed carry. .45 ACP 6+1 4.25″ 7.7″ 4.75″ 1.37″ 29.5 oz. the C3-CTC-WD, which features a stainless magwell and wood grain Crimson Trace Lasergrips. This entry was posted in .45 ACP, $1,001-$1,250, $751-$1,000, 1911, Compact, Semiauto, SIG Sauer and tagged Handgun Reviews on July 19, 2010 by Mike Boyle. I have owned this gun for about two years. I carry it in my truck in the center console. It is accurate, attractive, and reliable. At first I took it out on my farm to try it out and thought I made a bad purchase. The first 5 mags I ran through the gun didn’t feed on the last bullet. But after getting it broke in a little have not had any mote problems. I am extremely happy with this gun and am very confident in it after running thousands of rounds through it without any problems. The only thing I don’t like is the grip is a little short for my hand but after shooting with it, it feels comfortable and is easier to conceal with the compact structure. Overall is one of my favorite handguns. The Sig C3 is the best carry 1911 I have ever owned. The size and weight of the gun make it perfect for long daily carry. To top it off the C3 is very accurate. It shoots to point of aim and it takes most any ammo I feed it now that it is broken in good. It did have some failures to feed on some HP’s, but that soon worked itself out and it takes my chosen ammo without fail. It is a gun I can depend on when and if I need it. I would reccomend Sig’s C3 1911 to anyone looking for a self defense gun. The grip is great becuse it fits small hands one, and two it does not print like a full size gun. Just bought the C3 after searching out Kimber but read and have experienced Sigs ” hell and back reliability” and customer service. Sent about 100 rounds down range today and as stated above I experienced the same issue with the last round ( feed ). However am confident it will work itself out with additional rounds. FYI I did change out the mags to ( Wilson Combat)in hopes of avoiding the factory issue mags but experienced the same issues with last round feed. Accuracy flat out incredible (Speer Gold Dot 230gr) with very manageable recoil. Very happy with the purchase and it is one gorgeous gun! I have had the C3 with laser grip and night sights for about 9 months. I had some of the same problems first time out. I took it to the range a few days ago, fed it a mixture of ammo in a real mixture of mags. Not one problem. The C3 looks great and performs better. I would buy again. This gun was my first auto, I have been a strict revolver guy my whole life. I have been nothing but pleased with my purchase and have experienced none of the last load problems as mentioned in other reviews, this gun paired with a Crossbreed Supertuck holster offers all day carry comfort and with the CCO setup give great performance. Way to go Sig you have made me a 1911 shooter for life! I’ve got the sig c3 and it’s f—ing awesome Ive had it for about two years and it’s so accurate ,I carry it everywhere I go.oh and the laser is pretty cool to I would recommend this gun to anybody. I just purchased the Sig Saure c3 and am hoping it is all everyone says it is….I was looking at Para and Kimbers but decided on the Sig after reading all the positives you guys wrote…thanks…will update when I recieve it.. I recieved my C3 and could not be happier…everyone who sees it LOVES it and it is a shooter!!!! 25yds a little left of the bullseye all in a nice group….adjusted the windage and bingo…right on…thanks SIG SAUER for an outstanding product…..I included a custom leather paddle holster from Stoner holsters…what a combination…couldn’t be happier my new carry!!! I bought my Sig Sauer 1911 C3 almost 2 years ago. I’ve put over 1500 rounds through it without any kind of issues. No FTF’s, FTE’s, or stovepipes. I feed it a wide variety of ammo and it just gobbles em’ up and spits em’ out. I did replace the stock magazines with Wilson Combat magazines though. Just my personal preference. An absolutely fantastic carry weapon and deadly accurate straight out of the box. I carry it on a daily basis and sometimes forget I’m wearing it. I’d recommend this gun to anyone. I purchased my Sig 1911 C3 last week and it arrived today. Beautiful piece!!! Took it out to our local shooting range and was very happy with the shooting and feeding of the ammo. Not one malfunction with just over 200 rounds expended!! I am 70 years old and a retired peace officer and will be carrying the Sig daily, so I feel certain that I made the correct choice. A very smooth operating pistol. Congrats to you Sig Sauer on a very fine pistol!! I recommend this pistol very highly!!!! I bought my C3 several months ago and just love it! Very accurate, easy to shoot and beautiful! I was afraid that it would have a heck of a kick but it has less of a kick than my S&W .380 Bodyguard. My only complaint is that I sometimes have difficulty getting the pin back in. That will come with time as I get used to taking it apart, cleaning it and putting it back together. I have had this pistol for two years now and it is a rock star among .45cal…small…concealable accurate and speaks for you when you want it too…nice…nice pistol…thanks sig for making quality fair priced guns. I have several 1911’s, the Sig C3 will perform amongst the best of my Colts and Kimbers—I love the handling of this weapon–dead nuts accurate. I’ve had my C3 for about 6 months now and I never leave the house without it. It is accurate and dependable, by far the best 1911 I’ve ever shot. I have other pistols that are great but I only carry my Sig. I love my Sigs. I have a C3 and a carry scorpion and both have been flawless and 100% reliable through the first 2000 rounds each. I’ve thrown semi wad cutters and jhp’s through both with no ftf or fte issues. Great 1911 platform. I alternate my c3 and my glock 19 as my daily carry sidearms. Does the C3 come in 9 mm? Nicky: No, just .45 ACP. I love Sigs period. I just purchased a Sig 1911 C3 with the black Crimson Trace Laser’ grips and it is truly a beautiful gun. I love how Sig built this gun giving it a commander length slide and an officer sized grip frame, this combination works great together. I also have a Sig P220 Dark Elite and a Sig P229. I love them all and most of all I love the quality Sig puts into every one of their firearms. The Sig C3 is a top notch 1911…….